Stores Reference 22c/750. Size 7. 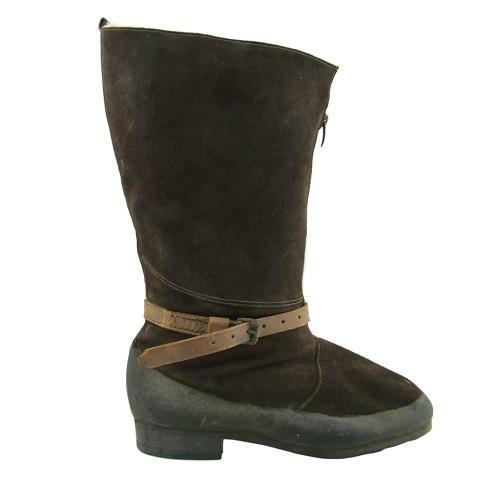 The brown suede upper is in excellent overall condition with only minor rubbing and soiling. The rubber “galosh” section is complete and in good order without loss. Very good war department broad arrow marked 'W' zip. There is some surface wear/cracking on the ankle strap. Original 'Itshide' sole and heel is in excellent condition showing virtually no wear or use at all. Minor soiling of the dense fur lining which is otherwise in excellent condition. No insole. Air Ministry King's crown and A.I.D marked zip tongue. Please note that this sale is for the right boot only! One can only speculate as to what happened to the other. Still makes a good display piece. When pushed for space the use of one boot of each pattern makes an effective display. Alternatively use it for spares. The early zip and ankle strap alone are valuable. Stock code B6880.